If you happen to be injured or lose a loved one in a bridge accident in Lee County, talk to the best Fort Myers personal injury lawyer you can locate as soon as possible. The first few steps after the accident are crucial to improve your chances of a successful financial recovery from the accident. First and foremost, you should take care of your injuries. Then you need to work on recovering physically and emotionally from the event. To help with all the legal and insurance issues, the Lee County bridge accident attorneys in Fort Myers at the Wolfson Law Firm can help. 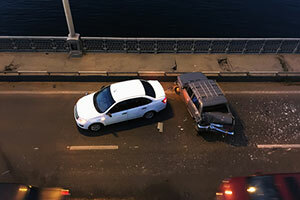 When you think about suffering a personal injury or losing a loved one due to wrongful death, bridge accidents are not the first things that come to your mind. However, our Fort Myers injury lawyers have represented innocent victims of negligence involving bridges in Florida and in some cases, the accident resulted in tragic losses. If you need a consultation with our Fort Myers personal injury attorneys, call us now at 239-777-9954 Our consultations are free. You won't pay anything unless we recover for you. Get the answers you deserve. Lee County is in Southwest Florida on the Gulf Coast. It is a popular tourist area with 740,000 residents, and many tourists flock all year round for the nice weather and pristine beaches. It borders with Collier County on the southeast, Hendry County on its east side, and Charlotte on the north. Major cities in Lee County include Fort Myers, Cape Coral, Sanibel, Bonita Beach, Lehigh Acres, Fort Myers Beach, and Estero. Caloosahatchee Bridge, part of US 41, a four-lane, single span bridge connecting Fort Myers and Fort Myers Beach over the Caloosahatchee River. Edison Bridge on State Road 739, connecting North Fort Myers and Fort Myers Beach over the Caloosahatchee River. It's a two-span, three-lane bridge. Midpoint Memorial Bridge, connecting Fort Myers with Cape Coral over Caloosahatchee River. It is part of State Road 884. Of course, this is not an exhaustive list of all the accidents that can happen on bridges around Fort Myers in Lee County. If you or a loved one have been injured in any kind of bridge accident, don't hesitate to call us for your free consultation. You may be entitled to damages recovery in ways that are not clear at first glance. What to do After Your Fort Myers Car Accident on a Lee County Bridge? Don't block the traffic. Move aside if possible. Call an ambulance or visit the doctor. Take care of your injuries. If you need medical help, get it as soon as possible. Call the police. The police officer will make a report with all the important circumstances of the accident. Make sure you tell him your story and get a copy of the accident report. Take contact information from witnesses. Most often there is someone else who witnessed the accident and could testify that it the accident was someone else's fault. It will be very useful later in the process. Take pictures of the accident. From all the eight sides of the scene if possible. Maybe the police officer won't put everything in the report, so these could serve as evidence. Don't say sorry and don't plead guilty. It is polite for everyone to say sorry after an accident, but the other side could use it against you. It is called an "admission" in the rules of evidence. Don't plead guilty in front of the police officer either, even if you get the ticket. The ticket can be dealt with in a court of law later and you will have your opportunity to prove your innocence. Call your insurance company to report the accident and obtain a claim number. Don't rush to accept quick offers from the insurance company. They know that you are likely ill-informed as to what you can recover and how much you should be compensated. Call a Lee County bridge accident lawyer in Fort Myers. You'll learn everything you need to know about recovering financially and you'll get valuable help and information on how to obtain the best possible result. Once you call us, we will investigate all the circumstances of your Lee County bridge accident in Fort Myers. We will gather the police report, statements from witnesses, your medical bills, your doctors' opinions on your injuries, and everything else that could help prove that you were the victim of negligence and that you should be compensated for your harms and losses. Then we will propose a settlement demand to the insurance company and give them reasonable time for response. They love to delay things, but if they remain silent, then we will not hesitate to file a lawsuit on your behalf and go to trial when necessary. This procedure is not simple, but the Fort Myers injury attorneys at the Wolfson Law Firm are here to help you and your family. We have dealt with accidents and insurance companies since 1963, and we don't ask for fees until we recover for our clients. Call our bilingual lawyers now for your free consultation at 239-777-9954. There is no absolutely no cost for you in calling us. The Wolfson Law Firm is at 3049 Cleveland Ave #140, Fort Myers, FL 33901 and serves the communities and neighborhoods of Lee County including Estero, Fort Myers, Buckingham, Cape Coral, Sanibel, Whiskey Creek, Captiva, San Carlos Park, Pine Manor, Burnt Store Marina, Fort Myers Beach, Cypress Lake, Gateway, Lochmoor Waterway Estates, Charleston Park, Page Park, Bonita Springs, Palmona Park, Babcock Ranch, Alva, Harlem Heights, Pine Island Center, Iona, St. James City, Tanglewood, Lehigh Acres, North Fort Myers, Punta Rassa, Boca Grande, Matlacha, Suncoast Estates, Matlacha Isles-Matlacha Shores, McGregor, Olga, Bokeelia, Three Oaks, Tice, Pineland and Fort Myers Shores.